Leading Manufacturer of ginger powder from Unjha. 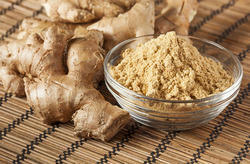 We are a leading manufacturer and exporter in the domestic market of a wide range of Ginger Powder. This product finds high demand among the clients, owing to its spicy smell and unique taste. This range of products is extensively utilized for cooking various dishes to enhance the flavor and taste of the dishes, apart from its use in beverages and snacks. Looking for Ginger Powder ?